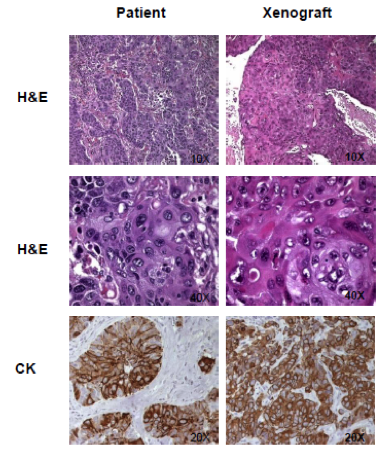 The complexity of human tumors that are highly heterogeneous in terms of cell composition and histologic features is insufficiently captured by the preclinical models classically used to identify new targets and to validate pharmaceutical agents directed against them. We believe that these limitations are a major drawback and may constitute a reason for the highly failure rate of novel agents in clinical development. Cancer stem cells (CSCs) are quiescent cell populations with enhanced tumor-initiating potential. They may give rise to more differentiated, highly proliferating cells, thereby contributing to tumor heterogeneity and have been implied in processes such as metastatic spread, chemo-resistance and resistance to radiation therapy. CSCs are highly dynamic and show plasticity in response to genetic, epigenetic and microenvironmental factors. Exiris uses a large collection of clinically annotated and molecularly characterized CSCs for drug and target discovery. These CSCs are the result of the seminal contributions of Prof R. De Maria to the field of CSCs and are licensed from the Italian National Institute of Health (ISS). 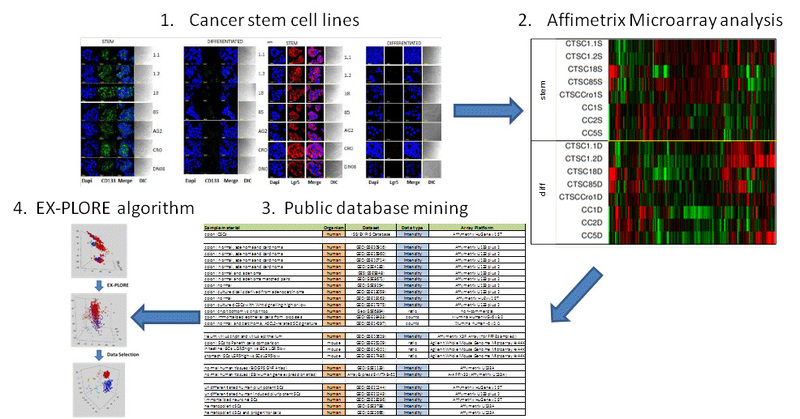 In contrast to commercial cell lines, CSCs reproducibly recapitulate cellular hierarchies in vitro and patient tumor histology in vivo. Using the proprietary Ex-Plore™ algorithm, we are able to identify novel targets in CSCs through a bioinformatic procedure, thereby increasing the speed of target discovery. This procedure was recently validated in the EU-funded ColCab project (Eurotransbio ETN-2011-03) using colon cancer stem cells. Antibodies directed against a first target, identified through Ex-Plore™, are being developed as novel therapeutic agents. Additional unbiased target ID technologies using display techniques will be developed in the near future. 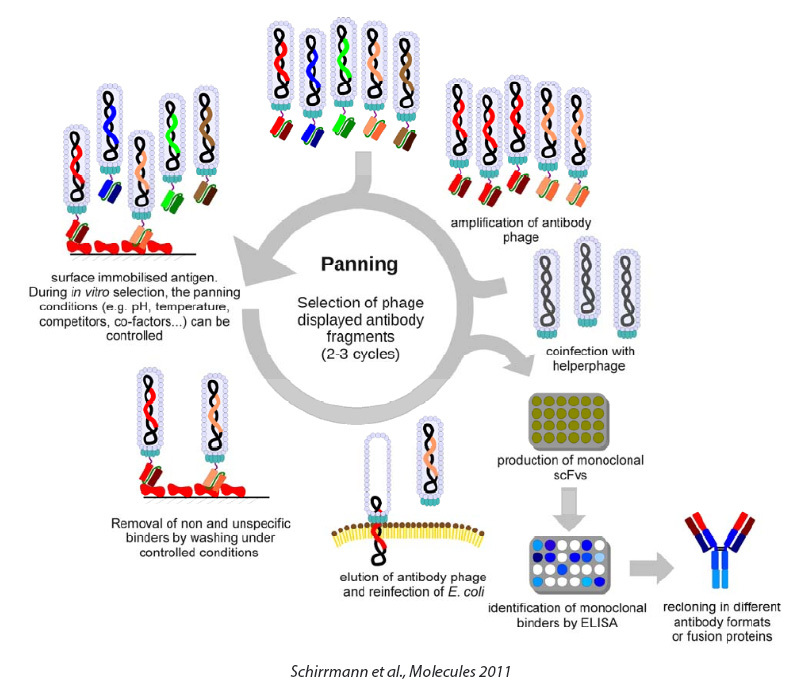 Antibody Drug Conjugates (ADCs) have emerged as a highly promising novel therapeutic approach. The principle of ADCs, apparently simple and straightforward, is to link a cytotoxic agent to a tumor-specific antibody, thereby causing a selective targeting of the cytotoxic drug to the tumor tissue. In reality, there are considerable technologic hurdles that had to be overcome in order to reduce the theory into clinically applicable practice. The potency of the cytotoxic drug, the linker technologies, the nature of the antigen, the properties of the antibody and the physico-chemical properties of the ADC all impinge on efficacy and therapeutic index. While Myelotarg, a first generation ADC, was withdrawn from the market due to tolerability issues related to suboptimal design, in recent years, two second-generation ADCs, Kadcyla and Adcetris, with improved technology were licensed for the treatment of advanced solid or hematologic malignancies. There are many additional ADCs in development throughout the pharmaceutical industry but thus far relatively few cytotoxic drugs were found to be amenable for the development of ADCs. Agents that would primarily target proliferating cells or that are substrates for drug efflux pumps (highly expressed in the stem cell compartment) are predicted to be poorly efficacious against cancer stem cells. Exiris, in collaboration with Prof N. Sewald from the University of Bielefeld, Germany, has identified a novel class of drugs, that shows picomolar activity against stem cells from colon and lung cancers. This discovery is subject of a patent application and is being exploited to develop novel therapeutic conjugates for the treatment of human cancers. Exiris is developing novel display technologies to generate fully human therapeutic antibodies. We envisage this platform to be also amenable to the generation of novel bispecific mAbs and to the site-specific introduction of drug linkers. This project is being carried out in collaboration with Italfarmaco.